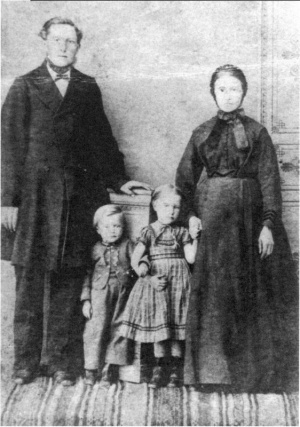 Heinrich B. and Helena S. Friesen, and their two children Helena and Abraham, ca. 1861. This is the oldest known Kleinege- meinde photograph. Preservings photo. Heinrich B. Friesen: pioneer farmer; born on 2 May 1836 in Rückenau, Molotschna Mennonite settlement, Russia, to Abraham W. and Elisabeth (Brandt) Friesen. He was the second of nine children born to his father’s first wife. Heinrich was baptized in 1855 and was married on 22 April 1856 to his second cousin, Helena Friesen (1835-1911). The couple had nine children. They immigrated to Canada on 17 July 1874, landing in Quebec before continuing on to Manitoba and then to Nebraska. Heinrich B. Friesen grew up in the Molotschna Colony of Russia. He came from a well-known family; his grandfather was a leader of the Kleine Gemeinde church, and one of his cousins was an early settler in Steinbach, Manitoba. Heinrich married his second cousin, Helena, in 1856 and the two settled in Rosenfeld, Borozenko. Heinrich worked as a teacher, and when in the 1870s, Mennonites became concerned about the possible loss of military exemption, he was instrumental in sending protest letters to the Russian government. When nothing seemed to result from the protests, many of the Mennonites decided to leave Russia for North America. Heinrich and Helena also chose to leave. In 1874, they left together with their children for a new country, arriving in Quebec on 17 July. Manitoba was a disappointment for Heinrich B. Friesen and his family. On their arrival, they stayed in Winnipeg for some time, earning money by herding cows and doing other odd jobs. Next, they moved to Rosenhof in the Scratching River Settlement where some of Heinrich’s relatives lived and tried to establish a life there. As time passed, Heinrich became discouraged about his prospects and on 4 February 1875, the family left by ox team and sleigh for Nebraska, where Helena’s parents lived. Despite a blizzard that caused hazardous conditions, the Friesens arrived safely in Moorhead, Minnesota and took the train from there to their destination. Heinrich B. Friesen and his family settled in the village of Heuboden near Jansen, Nebraska where they not only cultivated land, but Heinrich also became known as a “well-digger.” Heinrich and Helena’s children grew up, married, and moved to different areas of Canada and the United States. Heinrich died on 11 December 1900 in Jansen, Nebraska. His wife Helena moved to Steinbach, Manitoba for a while, then married Aeltester Abraham L. Friesen of Jansen, Nebraska and moved back to Jansen. In 1906 she and Abraham L. Friesen moved to a newly founded Kleine Gemeinde settlement in Meade, Kansas, where she died in 1911. GRANDMA (The Genealogical Registry and Database of Mennonite Ancestry) Database, 5.03 ed. Fresno, CA: California Mennonite Historical Society, 2007: #3672. Plett, Delbert F. “Heinrich B. Friesen (1836-1900).” Preservings No. 12 (June 1998): 67-68. Huebert, Susan. "Friesen, Heinrich B. (1836-1900)." Global Anabaptist Mennonite Encyclopedia Online. November 2007. Web. 21 Apr 2019. http://gameo.org/index.php?title=Friesen,_Heinrich_B._(1836-1900)&oldid=94749. Huebert, Susan. (November 2007). Friesen, Heinrich B. (1836-1900). Global Anabaptist Mennonite Encyclopedia Online. Retrieved 21 April 2019, from http://gameo.org/index.php?title=Friesen,_Heinrich_B._(1836-1900)&oldid=94749.